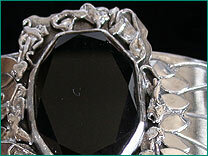 Sterling Silver Cuff Bracelets can be made in many widths, the most common being one-half inch wide. These Cuff Bracelets can be Hammered, made with Chisel Lines (like Waves Cuff Bracelet), and/or with Gemstones. I need your wrist size (in inches) for Custom Cuff Bracelets. Sales of “in stock” Bracelets is through my Etsy site. Click on a photo in the Bracelets category to see what is currently available in the store. My job as a jewelry maker is to connect each Gemstone with “it’s Person”. The true magic happens when you connect with the wearer. If you are interested in finding the perfect gemstone or sliver pattern for your wrist, please contact me to start creating something that is uniquely you!